The first week of January, millions of people seek out the latest gadgets, workouts, products and diets to shed the perceived 5 pounds that they gained over the last several weeks. While most believe they gain an average of 5 pounds over the holidays, research has clarified that it is in fact more like a single pound. While this may not sound harmful, the 1 to 2 pounds is rarely lost and can quickly compound as years pass. As little as 5% of an individual’s weight can alter the metabolic landscape within and either lead to better health or chronic disease. Cassie Vanderwall, UW Health registered dietitian, explains why the top ranked diets are those backed by scientific evident and social support. The U.S. News & World Report annually ranks the previous year’s Best Diets among nine categories from best plant-based diets to the plans that are easiest to follow. The two diets that never leave the ranks are the DASH diet and the Mediterranean diet. These two big winners maintain the strongest evidence basis for heart health, solid nutrition and ease to follow. The DASH diet, or dietary approach to stop hypertension, is a scientific strategy posited to initially lower hypertension but many have also seen that when people consume 8 or more servings of fruit and vegetables, strive for lean protein and low-fat dairy and keep their sodium (salt) intake low at less than a teaspoon each day they also see improvements in their cholesterol levels and waistline. 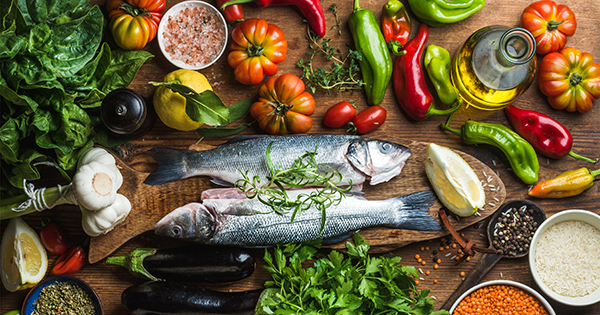 The Mediterranean diet was popularized due to the longevity of individuals who live along the Mediterranean Sea. This dietary lifestyle is comparable to the DASH diet because it is loaded with plant-based foods, whole grains, as well as, plant-based proteins. It is unique because it encourages an abundance of healthful fats from fish (tuna, salmon, sardines, herring), olives, nuts and seeds. The Mediterranean approach also recognizes the benefits that come with consuming alcohol in moderation on a daily basis, but don’t clink your glasses, yet. These benefits are typically only seen in individuals who regularly consume alcohol, not those who starting consuming. The Mediterranean diet also grounds itself in physical activity and daily exercise. The American Heart Association gives a nod of approval and encourages most to strive for at least 150 minutes of aerobic (heart-pumping) exercise each week. The Weight Watchers program also held strong in categories of weight loss, fast weight loss, commercial diet, ease to follow and fourth for the best overall diets. The Weight Watchers program invites people into a community filled with resources and support. It also provides the benefit of continuing to eat foods you already enjoy. While the point-system can become overwhelming, many appreciate the opportunity to take a closer look into what they are eating. While the first two best overall diets (DASH and Mediterrean) may not be a surprise, there are two new “kids” on the block- the Keto Diet and Dr. Fuhrman’s Nutritarian Diet. The popular ketogenic diet tied in last place for the best overall diet. It is a low carbohydrate diet that is higher in fat which shoves the body into a ketogenic state which forces the body to use fat and protein for energy. The 6-week Nutritarian diet is a short-term vegan diet but the evidence was lacking and it also came up last for best overall diet. Other lower ranking approaches included The Whole 30 and Dukan diets. These lower-ranking approaches were criticized by the expert panelists for being overly restrictive and not sustainable; experts also rank diets that educate consumers on positive eating habits higher than those that discourage whole food groups. The takeaway message this year is similar to those in the past. The DASH and Mediterranean diets are best overall for those seeking to prevent or manage chronic disease, as well as, achieve or maintain a healthier weight. Right behind these is the Weight Watchers program, which is best for those who seek the community and flexibility of maintaining a comparable dietary approach. Overall, science and social support win again! If you are interested in learning more or want to individualize one of the best diets to fit your needs, look no further than UW Health’s Nutrition experts. Call 608-890-5500 to make an appointment.